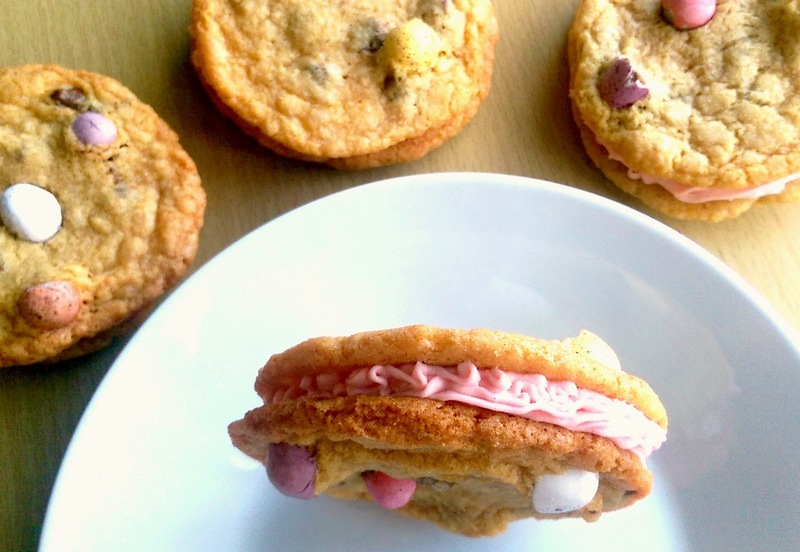 My sugar coated life...: Pink buttercream filled mini egg cookies! 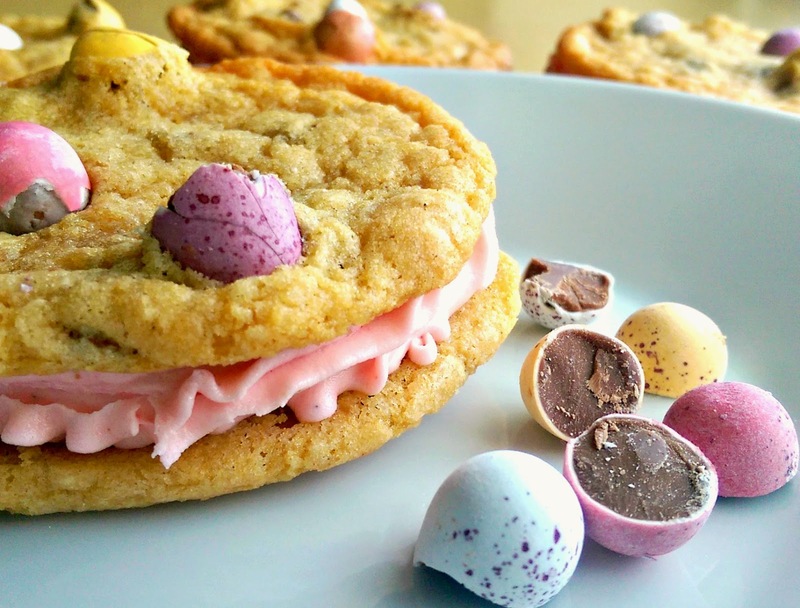 Pink buttercream filled mini egg cookies! There isn't much in life that can't be improved with pink buttercream. Even now I'm making it with Vitalite (as a dairy free alternative to butter) it still has the ability to cheer me up whilst I scoff down a spoonful between meals. These cookies don't really variate from my standard cookie recipe except they include MINI EGGS! Yes, 'tis the season of egg shaped chocolate and now Hotel Chocolat have launched a milk free milk chocolate egg - I too can look forward to a creamy milk chocolate filled Easter. 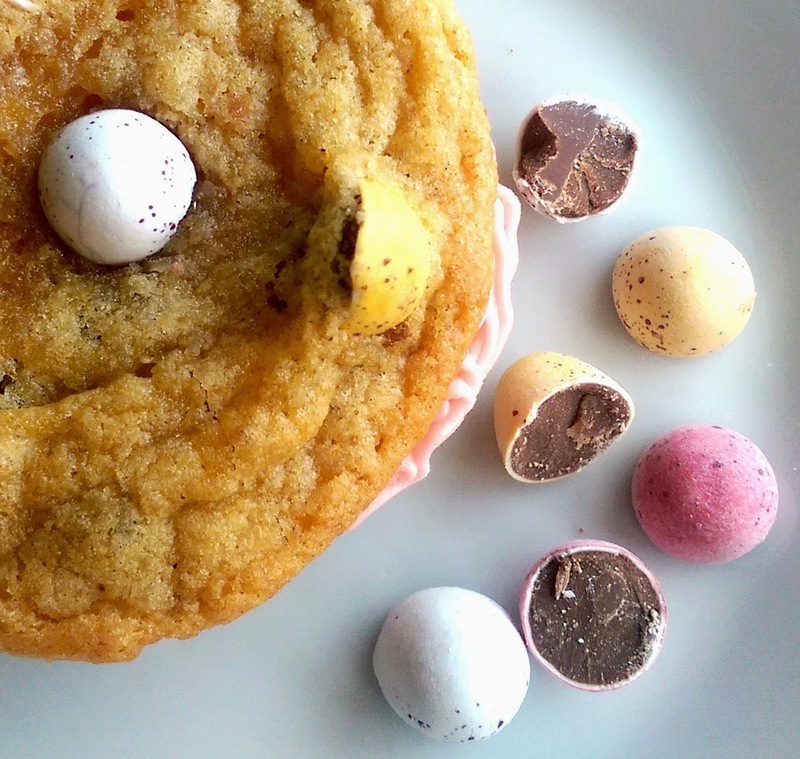 Even though I can't eat these cookies, they're just as much fun to make as to eat and you can swap the mini eggs for any delectable mix in really - I love the idea of adding in mini creme eggs or chunks of leftover Easter chocolate. Combining chocolate and cookie dough always ends well in my book! Preheat the oven to 180°C, gas mark 4. Line cookie sheet with greaseproof paper. Cream butter and sugars till pale and fluffy, once creamed, add in the egg and vanilla. Sift in the flour and salt, then the chocolate chips or other 'mix in' of your choice. Roll into walnut size balls and press gently to flatten the top of the cookies. Place the chopped mini eggs into the top of the unbaked cookies. Bake for 7-10mins until the cookies are slightly brown around the edges and the centre will remain soft and chewy. Remove from oven and allow to cool on baking sheet. Transfer to a wire rack to finish cooling whilst you prepare your buttercream. Beat butter until pale and fluffy, add in vanilla bean paste and then carefully add in your icing sugar. If colouring your buttercream, I always recommend a gel paste colouring rather than the bottles you can buy from the supermarket. If your buttercream looks dry, add a drop or two of milk and continue beating until creamy and ready to pipe as a filling to your cookies. Fill a piping bag with buttercream, I use a standard open star piping nozzle and pipe half of the cookies with a rose swirl type design being careful not to go to the edges of the cookie. Once you combine the filled cookie with it's empty partner then the buttercream will duly squish out of the sides giving you a glimpse of the pink buttery filling! Oh yum these look so good Liana! Thank you so much Kelsey, mine eggs are just the cutest! I was having a super rubbish day then I spotted these gorgeous cookies - buttercream and mini eggs?! Genius!! Consider them pinned and bookmarked! Pink buttercream works wonders for rubbish days! I hope you enjoy them!